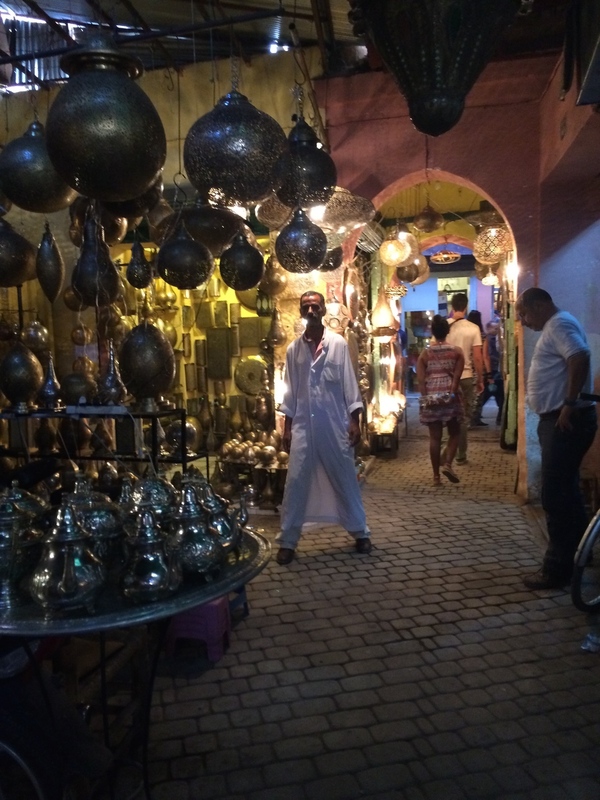 So two days into marrakech, and the cultural shock waves have subsided to some degree. Being initially well read on what to expect in terms of traveling as a woman, bargaining in the medina, taxi costs and such, I was on high alert. Even packed with my arsenal of trip advisor tips, and wikitravel docs, we will still managed to get duped on our taxi rate and distance to the hotel…only to learn later that 200 dirham (about 20.00) is the going rate for anywhere from the airport, no matter the distance. Having gotten over smarting on that one, we were happy to arrive at our hotel, which lived up in most respects to our hopes and dreams for travel weariness. Althougth, the wifi (“wee-fee”) left something to be desired….hence me getting this post out in Croatia a week later. Our first trip was into the medina with a guide, only to later read the guide book to understand the “commission structure” of said guide. What is that saying? “when in doubt ask for directions?” in Marrakech, it should be “when in doubt, read the guidebook!" The souks as expected were wild with all kinds of wares, sellers ready to pull you in the first chance they got, and the act of bargining and getting your price, left you with a bunch of stuff you never wanted in the first place. The end goal it seems, is really in the means. Well worth the trip, I picked up some coveted argon oil, and royal tee with orange blossom oil. Supposedly, this cures insomnia....more to come on that back in the states! The sites, sounds and smells as you might imagine are almost an assault to the senses, from the vats of spices to the yummy leather, (once cured of course...nevermind the tannieries, full of vats of pigeon poop, holy rotten things batman!) to the meat and fish being slaughtered in front of you. A essential part of understanding that there is virtually nothing that goes to waste here from the earth, to the wildlife. Being that shopping is my fave pastime, (and bargining is in my bones....thanks mom!) I wasn’t surprised to see in Marrakech, it’s basically an olympic sport. I was more than happy to throw my hat in the ring. And as to reward my hard work, I felt is appropriate to take a rubdown at the spa upon the conclusion of our trip. A few glasses of wine in, it was a nice little 30 minute nap.